Photo: These children in our orphan care program enjoy the benefits of a nurturing home, education, nutrition, and medical care. We are happy to report that 120 of our orphans completed their end-of-semester exams in October. They diligently prepared for these exams by studying their native Burmese language, English, geography, history, math, science, biology, and physics during this past semester at the different local schools where they are enrolled. As a reward for their hard work and to celebrate the semester’s end, our native team prepared a feast of delicious local pork and chicken dishes and a variety of fresh fruit. During the 10-day school holiday, the boys enjoyed playing football, the girls learned popular local dances, and all of the children had fun watching TV and movies. The children started back to school this month, and they are looking forward to another successful semester. In addition to donations made by our orphan sponsors, our children’s education is made possible by profits from our 12-acre farmland project and on-campus gardening project. Our farmland enterprise produces several tons of rice each year, and along with our gardening project, our native team in Myanmar is able to serve over 400 meals each day to orphans and staff in our 6 orphan homes in the country. However, during special times of the year, we need your extra support to pay for one-time needs that arise, such as our back to school season in June, when we must provide school supplies for these 120 children. Earlier this year our team prepared the farmland for a rice harvest which we expect to occur either this month or in December. And our orphan home directors have been tending to a gardening project on our main campus to supplement the diets of the orphans with fresh organic vegetables, such as chilies, okra, pumpkin (pumpkin leaves are a favorite in many local dishes), and mustard greens which are harvested as needed. Along with providing the children with quality nutrition support, the rice harvest and garden project will also save our directors money they would have spent on rice and vegetables at the market. 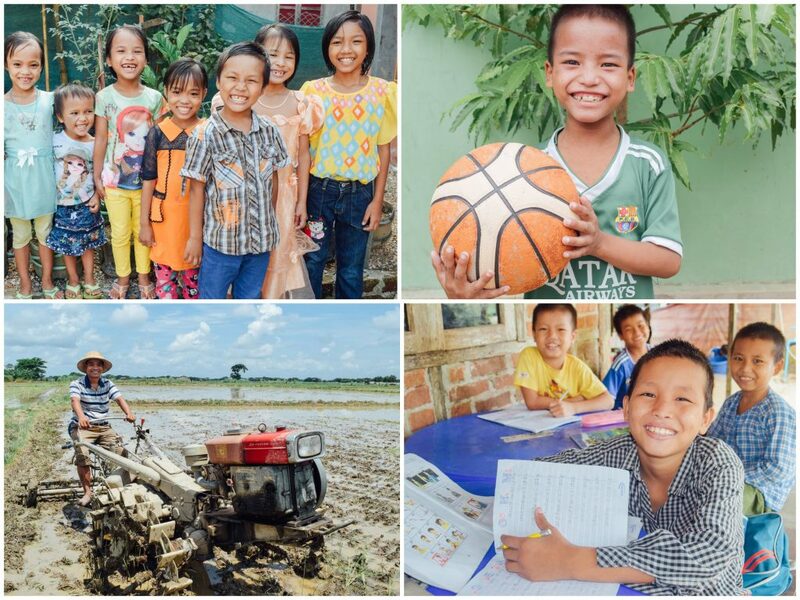 Photo inset: (Top-left): The children living in our 6 Myanmar orphan homes are thankful for the loving care they receive — nutritious meals, a good education, and medical care. Many were neglected and abandoned prior to living at our home. 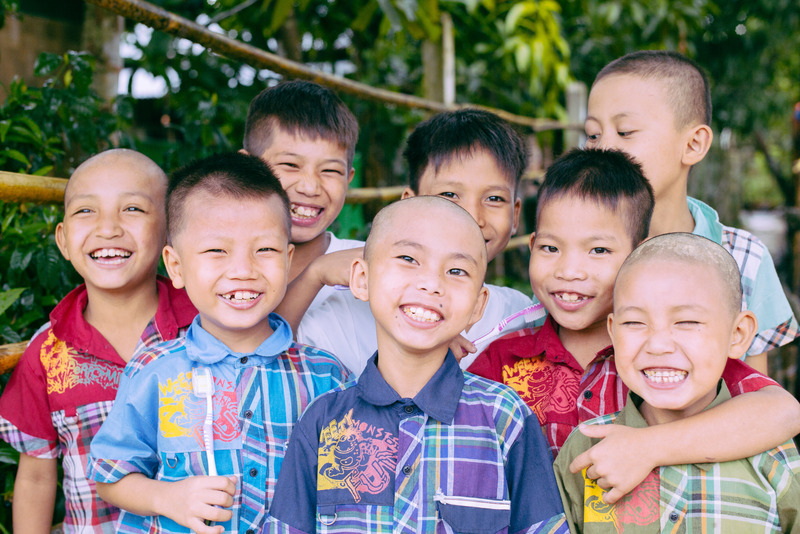 (Top-right): David’s former life of neglect and abandonment has been transformed since coming to live at one of our Myanmar orphan homes; he is now thriving with hope for a better future. (Bottom-right): 120 of our orphans have been diligently working on their studies and recently completed their end-of-semester exams in October. (Bottom-left): Our 12-acre Myanmar farmland project produces several tons of rice each year, which is used to feed our orphans & staff. They are still seeking to generate some profits from piggery projects. With your support, all 6 orphan home directors need to raise $500 each to build their backyard piggeries and purchase a mother pig and 3-5 piglets. The pigs will be sold in the market once they reach maturity, thus providing additional funds for our Myanmar programs. Also, one of our orphan home directors is still seeking to buy new land — he rents a house for his orphans and family to live in. Every year it seems their current landlord has a change of heart about allowing an orphan home to operate on his property, and then doesn’t allow our director to renew. Our hard-working director has to search high and low to find a new home, and it’s very difficult to find one that will allow so many children. Thus his dream is to have his own land and own his own home. He has saved up $5,000 and now needs your support to raise $15,000 more for his land upon which he will build his own home. Lastly, we want to share the redemptive story of a child who lives at one of our orphan homes. 9-year-old David was born in a small village very far away from our location. When David was 4 years old, his father was blinded in an accident and his mother left because she could not handle their stressful life. Soon after, David’s father died and the child had no one in his life to help him, take care of him, or provide for his nutrition, clothing, or education. David was very sad, hungry, hopeless, and lonely for a long time. Thankfully, one of our friends who was traveling back to his home village, met David and brought him to live at one of our orphan homes when he was 7 years old. David’s sorrowful state has been transformed because now his life is safe and secure and he receives nutrition and education support, clothes, shoes, backpacks, and school supplies, and he has many friends who have become his loving family. David is currently in the 2nd grade, his favorite school subjects are his native Burmese language and English, his favorite activities are playing football and singing, and his favorite foods are chicken, pork, apples, bananas, and mangoes. If you would like to sponsor David, just follow this link for information.